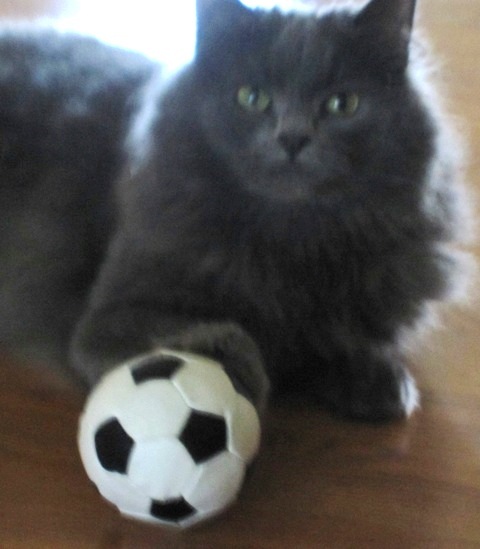 At our house these days, everyone is enjoying watching and talking about the World Cup Soccer tournament. This afternoon finds four teenage boys gathered around the TV and computer, eating pizza, watching the semi-final game, and throwing a miniature ball around the room. Even Ted, our Manx cat, enjoys getting in on the action. Communication. Whether arranging a semi-final game party via text messaging or moving the ball down the field effectively, it won’t happen without engaging each other verbally and non-verbally. Social and emotional intelligence. Being attuned and aware of those around you, building pride in accomplishments, sharing a common goal, coaching others – all come into play during a soccer match. Preparation followed with flexibility and adaptability. Vince Lombardi said, “Only perfect practice makes perfect.” Yet, even with perfect practice, once on the field of play, flexibility and adaptability are what winning teams use to find a way to win. Motivation. It’s not enough for the coach to want to win, each player has to want to win too. I witnessed some of the games where star players clearly weren’t finding the passion within themselves while the lower ranked team had members who gave their best energy and won the game. Celebration. Cheering, shouting, and wearing the team colors are all ways of demonstrating support and providing instant feedback on how things are going. And yes, it’s more fun when you win! The lessons for leaders: Your job is to provide resources and support that build the confidence of players in themselves, each other, the team, and the excellence of the surrounding system. Ethics, fair play, mentoring, smooth transitions, continuity, and collaboration should not be luxuries or lip service; they create the margin of victory. What organization development lessons have you discovered from the World Cup or other sports? I appreciate the insights of the game and OD practices. For the few games I did watch I was so caught up in the “buzzing” and back and forth playing, that I overlooked the organizational issues. Well done. Now sitting back and thinking about it from an OD perspective, I would add that the spirit of inclusion and diversity also offered a lesson for organizations. Teams were not made up of just players from a particular country, they were inclusive of talents born in other countries as well. Diversity of the traditions of followers, whether in South Africa watching the game or viewing from a pub in the home country. Diversity of engagement and celebration – I’m not sure the world ever heard of a vuvuzelas before. And I guess, a point that is most appropriate, is the diversity across countires and teams to honor and respect each other for just being there and contributing to the event. Obviously everyone wants to win – and there can only be one team that holds the title. But the genuine spirt of acceptance among the teams and the fans demonstrates the energy we can gain from embracing differences, whatever they may be, in our workplaces, and creating cultures that motivate and engage diverse creativity and innovation. Thanks for the view through the game. Thank you! Interesting and excellent addition to the conversation, Debbie. I had never heard of vuvuzelas either. May we all actively seek to encounter and experience diversity, embrace our differences, and become more together than we are alone.